TPO roofing material is highly versatile, read on to find out if it’s right for your roof! First, a great benefit of a Mule-Hide TPO Roofing System is that it can be installed quickly and economically. UL and FM listed assemblies are available upon request. All the accessories you need to complete roof details around edges and penetrations are also stocked locally. White surfaces have been shown to reflect up to 78% of the sun’s rays to reduce air-conditioning costs. The superb reflectivity of white TPO even reduces the heat build-up under the membrane. 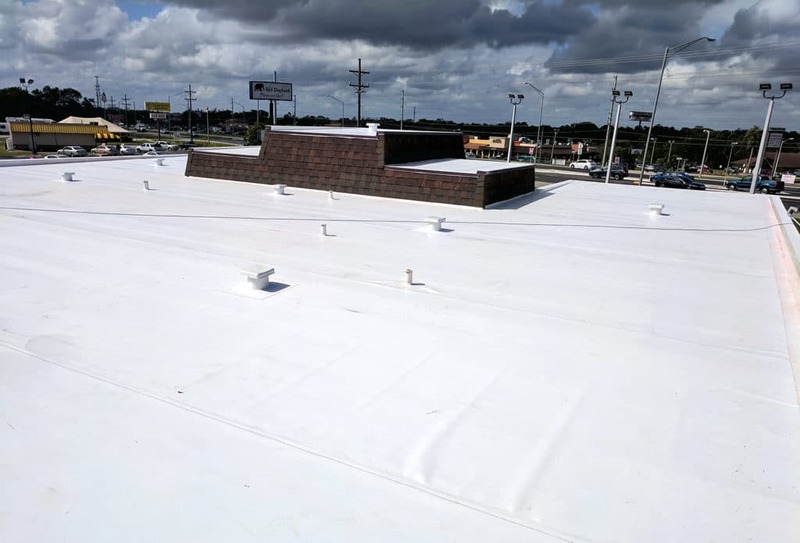 TPO roofing material provides excellent resistance to fire, UV, airborne bacteria, and industrial pollutants such as air-conditioning coolants. A plus for the environment, TPO contains no chlorine. Available in widths of 8′, 10′, and 12′, TPO allows for fewer seams. This means fewer labor costs when compared to standard PVC sheets. With more product on top of the scrim where you need it most, TPO is one of the thickest top plies in the industry. TPO roofing material keeps moisture out, yet is lightweight. This makes it ideal for new construction and retrofit installations without adding excessive weight to the roof deck. That’s not all, TPO can handle the desert sun, sand, arctic freezes, and torrential downpours. It stands up to rooftop traffic, tools, equipment and more. Another key point of TPO roofing material is its flexibility. Furthermore, the membrane retains its flexibility even in hot and cold temperatures so, it will not split or crack. Last but certainly not least, TPO membranes remain repairable year after year, allowing for ease of future cutouts, alterations, and tie-ins. As a matter of fact, TPO is cleanable to retain a like-new appearance. Is A TPO Roof Right For You? If your business would like to schedule an estimate for a TPO roof repair or replacement, please call R.I.G. Construction and Roofing at 863-294-4477. No matter what type of roof you choose, you can trust our team of professionals at R.I.G. Construction and Roofing. Our highly trained and experienced employees can skillfully complete roofing projects for commercial businesses and residential customers alike. R.I.G. Construction and Roofing serves customers throughout Polk County, Florida including Lakeland, Winter Haven, Davenport, Haines City, Lake Wales and Bartow. This entry was posted in Articles, Blog, Commercial Roofing, Flat Roof, TPO and tagged commercial roof, tpo.